When a theft has occurred, the tantrik is called. 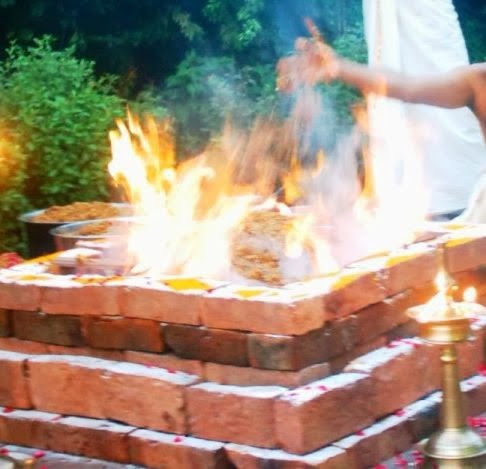 He starts a havan by preparing a homa kunda with mud and firewood and lights the fire, chanting mantras for some time. After the prayer, he fixes a four-foot long stick in the ground and asks the assembled people go into the room one by one, touch the stick at the top and pray. The thief is easily caught. He warns the people that the thief will suffer dire consequence if after touching the stick he tells a lie that he has not stolen. Propos: Bricks to make the homa kunda, mud to fill it, wood scrapings, matchbox, ghee, flowers and 4’ long stick, asafetida. Method: Apply Asafetida Oil on the top of the stick and stand it vertically in the mud. Those who are innocent will touch the top of the stick while the thief will no touch it out of fear of dire consequences. After each person comes out, the tantrik raises their hand and chants some mantras. Their fingers will smell of asafetida. The person whose finger does not smell is caught and the stolen materials recovered.